The National Institute for Occupational Safety and Health (NIOSH) recently developed a series of validated models utilizing computational fluid dynamics (CFD) to study the effects of air-blocking shelves on airflows and respirable dust distribution associated with medium-sized surface blasthole drill shrouds as part of a dry dust collector system. Using validated CFD models, three different air-blocking shelves were included in the present study: a 15.2-cm (6-in. )-wide shelf; a 7.6-cm (3-in. )-wide shelf; and a 7.6-cm (3-in. )-wide shelf at four different shelf heights. In addition, the dust-collector-to-bailing airflow ratios of 1.75:1, 1.5:1, 1.25:1 and 1:1 were evaluated for the 15.2-cm (6-in. )-wide air-blocking shelf. This paper describes the methodology used to develop the CFD models. 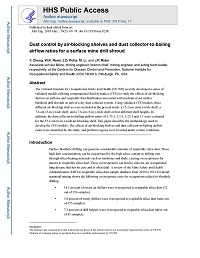 The effects of air-blocking shelves and dust collector-to-bailing airflow ratios were identified by the study, and problem regions were revealed under certain conditions.